Shop RCF SUB 702AS MK2 1400 Watt 12" Powered Subwoofer from AMS with 0% Interest Payment Plans and Free Shipping. Housing a 12 inch woofer, the SUB 702-AS II, is a very compact active sub enclosure and features a 1400 W powerful digital amplifier. It is the ideal complement to 8-inch or 10-inch speakers, creating small but powerful satellite systems with outstanding performance. Thanks to its compact size it can easily be carried and is very quick and easy to start using the built-in digital stereo crossover (DSP) with adjustable crossover frequency to connect the satellite. I already owned a 15" powered RCF subwoofer. I love it, but it clunky and heavy and a little bit of overkill for some of the acoustic solo and duo gigs that I do. I wanted something smaller that would still deliver the right amount of low end and punch. Since I was already a happy RCF owner, I opted for the 702AS MKII. First impression was "Wow, that's tiny!" I've used it several times now for 2 inside DJ gigs, 1 inside duo gig, and 1 outside duo gig. I'm using 2 Alto 10" powered speakers for the top end. 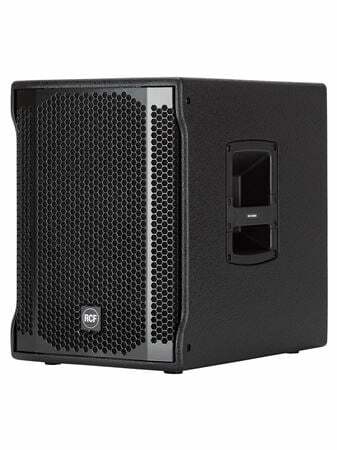 I switched to 2 EV 12" powered speakers for the DJ events for more "oomph". The sub sounds great and performed well in each one of those situations. For such a small form factor, it really gives you nice bottom end and punch. Very happy with this little guy.